From the bestselling author of Invisible and The New York Trilogy comes a new novel set during the 2008 economic collapse. Sunset Park opens with twenty-eight-year-old Miles Heller trashing out foreclosed houses in Florida, the latest stop in his flight across the country. When Miles falls in love with Pilar Sanchez, he finds himself fleeing once again, going back to New York, where his family still lives, and into an abandoned house of young squatters in Sunset Park, Brooklyn. 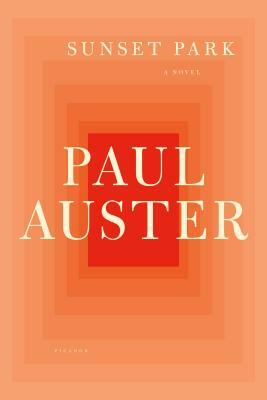 Woven together from various points of view—that of Miles's father, an independent book publisher trying to stay afloat, Miles's mother, a celebrated actress preparing her return to the New York stage, and the various men and women who live in the house—"Auster seems to carry all of humanity inside him" (Jan Stuart, The Boston Globe). “Exquisitely crafted, surprisingly tender... A story grounded in the potent emotions of love, loss, regret and vengeance, and the painful reality of current day calamities.... Auster fans and newcomers will find in Sunset Park his usual beautifully nuanced prose.... [and] a tremendous crash bang of an ending.” —Jane Ciabattari, NPR "Books We Like"